Find out if you have conceived using our ultra sensitive pregnancy test strips. 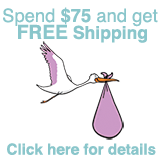 The pregnancy tests that we sell are of the highest quality available in Canada. They are over 99.9% accurate, providing guaranteed reliability. Pregnancy tests work by detecting the human chorionic gonadotropin (hCG) hormone in urine which increases during pregnancy. Our tests detect this hormone level at only 10 mIU/ml, making these some of the most sensitive and accurate tests available. With a detection tolerance this low, you can expect a positive result in as few as 3-5 days after implantation. By using a quality, sensitive pregnancy test you will be able to detect your pregnancy earlier than most "off the shelf" tests. 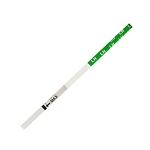 A wide 5mm strip makes visualizing the test results easier compared to other thinner test strips. An approximate 18 month expiry date. Very reliable, over 99.9% accurate. Detects the hCG hormone at levels of just 10 mIU/ml. I've been trying to get pregnant for a year, 1 miscarriage. I bought 50 of these strips and went thru them all (i obscessively test starting about 6DPO until AF. I ordered a new batch, second day into the new batch (DPO) I got a faint positive. I double checked with Clearblue test and it was negative. Next day, still paint positive, again double checked with Clearblue test and it was still negative, so I went out and bought "First Response" which confirmed a faint positive. So, these tests are on par with FR and better than Clearblue! Highly recommend. Easy to use, accurate, sensitive and much much cheaper than the drugstore tests. I'm a bit of a POAS addict. I tested the day I got these (7dpo) to check for evaps...stark white. The next morning a got a super faint line. The line continued darken and was confirmed with a frer on 10dpo. Unfortunately, it was a chemical and I followed my hcg down with these tests, as well. I was still pulling lines when my blood hcg was 6. I would definitely use these test again. I used these tests for one cycle only (I had been using the other tests available here for the previous two cycles - the regular sensitivity strips & midstream). I tested at 9DPO and got a negative result. There was no evaporation line within the recommended interpretation time frame. I got my BFP at 10DPO. It was faint, but it was there! I continued to test for fun and the test line continued to darken. Shipping was fast & arrived in a confidential box. Thought these did not work but I was wrong! I have to say when I first started using these tests I thought they did not work (as I was sure I was pregnant). I was wrong, these really do work!! I read so many reviews before I purchased these of ultra sensitive tests not working properly and even giving false results (other brands reviewed). Not these!! When I first started to used these I recalled others saying these did not leave evaporation lines. Well they do, but there is a way I discovered to tell the difference. Evaporation lines are only visible at certain angles and the line you see is very thin, not fat like the test line. So I used these tests again this month at 8 DPO. I thought I saw a very very faint line!! Not sure though. So I kept testing throughout the same day (3 times) and each time the line got more visible. I was pregnant!! It was also easier to see the very faint line if you held it close to a window with something white behind the test strip to make it stand out more. Next day at 9 DPO I tested again and darker still. I have been testing daily since and every 2/3 days the lines get twice as dark.....so these work and work well!!! Thanks so much MAB for providing such an awesome test that works well and is reasonably priced that I feel comfortable testing numerous times a day if I want without costing an arm and a leg!! I must first day that I was very impressed by the confidentiality of the shipment. It has no indication that it's a pregnancy test anywhere. Although I have not yet had a positive result, I have no had a false positive, any evaporation lines or and duds. I will definitely purchase again, although I'm not going to lie, I really hope I won't have to soon!